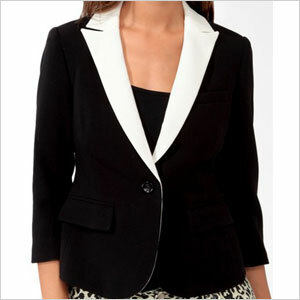 A well-fitted blazer is an important staple in every woman’s wardrobe. But if you’ve been having trouble picking out one that looks perfect on you, check out these tips on choosing a style that fits your body just right. A good blazer can be worn for so many situations. It can give you a professional look for a job interview or add a trendy, sleek flair when you head out with the girls. A poorly fitted blazer, however, will just leave you feeling bulky, so be sure to pick the perfect one for your unique shape! If you have a straight shape, it means your bust, waist and hips are more or less in line. Lucky for you, plenty of styles look great on you. The key to finding the perfect look is to pick a blazer that nips in at the waist to create a nice hourglass shape. Your even shape also means you can have fun with playful patterns and colours. 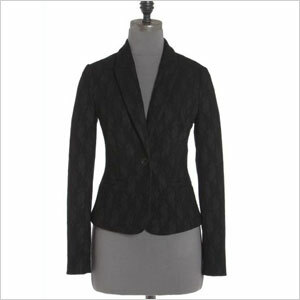 The lace fabric on this ponte blazer is positively eye-catching, and the single button will give the illusion of a narrow waist (jacob.ca, $149). If you have a pear shape, it means your hips are wider than your upper body, so avoid blazers that fall to your hip line, as they will cause your hips to appear larger. Instead, look for blazers that are cropped to just above your hips or ones that fall just below your hip line. Blazers that have unique notes on the top, such as wide lapels or piping on the collar, also work because they draw the eye up and help balance out your shape. This contrast lapel blazer, for instance, will give the appearance of a thinner, more defined waist and also add a unique flair to your neckline (forever21.com, $40). If you have particularly wide shoulders, you are what is called an inverted triangle shape. This body type isn’t the easiest to find the right blazer for, but when you do track down the right one, it will be a spectacular look for you. The key is to find a blazer with minimal or no shoulder padding, as this feature will only accentuate the size of your upper half. Blazers that are less structured and made of flowing fabric will also help give your body a softer look. 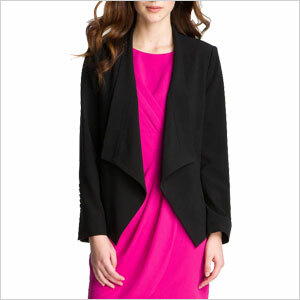 Check out the relaxed shape of this woven jacket (nordstrom.com, $101). Women with an apple shape are rounder through the midsection and don’t have much definition at the waist. If that’s the case for you, your best bet is a blazer made of thinner fabric and that falls to below your hips. Avoid bulky fabrics, as they will add unnecessary width to your midsection. 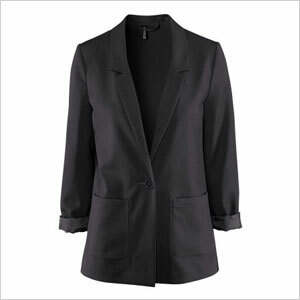 This unlined, straight-cut jacket, for example, will do a great job at evening out your torso and increasing definition at the waistline (hm.com, $30).